With a custom floor coating, mechanic shops can look more professional and be much easier to keep clean. Prestige Floor Coating developed a unique formula of floor coatings for mechanic shops in the Mid-Atlantic region that are able to last for years and years. Our coatings stand up to car tires, foot traffic, heavy tool carts, auto fluids, and more. If your mechanic shop has begun looking worse for wear because of a cracked or peeling floor, Prestige Floor Coating has your near-permanent solution. Call us at 443-519-2628 or contact us online to request a free estimate for a floor coating designed for mechanic shops. The typical floor paints for garages are not strong enough for the action seen at a mechanic shop. Re-painting every year creates an ongoing headache for your business. Floor mats are comfortable, but they trap grease and grime underneath so you can’t cover the whole shop with rubber mats. Prestige Floor Coating created our epoxy-based mechanic shop floor coating as an advanced formula that bonds at the molecular level with the concrete surface. It measures in at 800% stronger than concrete and features an anti-skid, rubberized membrane for safety and easy cleaning. Our product gives your mechanic shop a showroom-like appearance that your customers will love. You’ll love the fact that it installs in just a few days and lasts for years. Oil spills and chemicals mop up easily, and otherwise, you only need to sweep and spot clean. 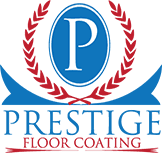 Prestige Floor Coating offers professional installation of our exclusive floor coatings to ensure your mechanic shop gets the longevity and quality you expect. We start by repairing cracks and diamond-grinding the floor to prepare it for proper adhesion. The floor shop application goes on in five layers so that it bonds with your concrete properly. The final coats can feature a custom color to match your mechanic shop’s branding and color scheme. It’s not a paint job; it’s an epoxy floor coating that bonds with the concrete, you’ll perhaps never need to re-coat your mechanic shop flooring again. We offer a 2-year commercial warranty to protect against any flaws at installation—we’ll re-do the floor coating if necessary. Prestige Floor Coating installs top-quality, long-lasting floor coatings for mechanic shops in the Baltimore, Maryland area as well as the surrounding Mid-Atlantic region. Request a free estimate online or call 443-519-2628 to find out more about our epoxy floor coatings for mechanic shops.